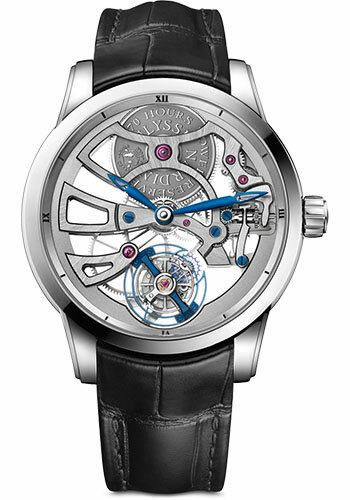 44mm 18K white gold case, grey dial with skeleton tourbillon, caliber UN-170 manual winding movement, approximately 100 hours of power reserve, black alligator strap. Water resistant to 30 meters. 44mm 18K white gold case with hand painted flange, motif Royal Python, sapphire crystal, Caliber UN-170 Manual-winding movement with flying tourbillon, exceptional power reserve of 170h, leather strap, simple buckle. Water resistant to 30m. 44mm 18K white gold case set with 133 diamonds, Caliber UN-170 Manual-winding movement with flying tourbillon, exeptional power reserve of 170h, leather strap, simple buckle. Water resistant to 30m. 44mm 18K white gold case set with 133 diamonds, sapphire crystal, Caliber UN-170 Manual-winding movement with flying tourbillon Exceptional power reserve of 170h, leather strap, simple buckle. Water resistant to 30m.